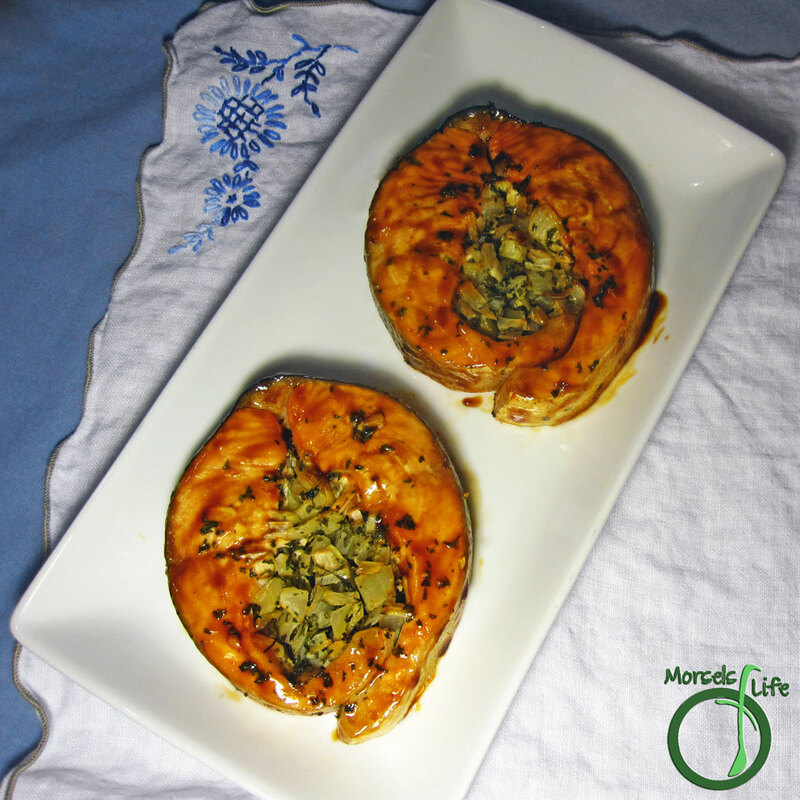 Delightfully sweet and savory, these salmon medallions stuffed with perfectly seasoned onions please both the eye and palate. We recently bought some salmon steaks, so I started thinking about how I wanted to eat them. There's always the super easy Garlic Salmon or Teriyaki Salmon or something like that. But I didn't want to "waste" a salmon steak on something I could make with a fillet. Then I thought about restaurant-style salmon steaks where they stuff something in the middle. I never really tried to make anything like those salmon steaks before since I figured it'd just be super complicated or not work at all. Or both! Well, I was wrong. Making these Salmon Medallions is as simple as chopping some onions, mixing in some parsley, and making the sauce. The hardest part (or rather, the most time consuming part for me was actually removing the bones from the steak, but you can avoid doing that if you buy the de-boned steaks. The only other potentially difficult part might be getting the ends of the salmon to stick together. My salmon steaks held together pretty well without assistance, but you could also tie some string around the salmon to hold it together. Don't you just love these fancy (looking) yet relatively simple recipes? I know I do! Mix the onion, green onions, parsley, and garlic. Place a handful of the mixture in the middle of the salmon steak and wrap the steak around the mixture. Mix remaining materials and brush over salmon. Bake at 375F until fish done, about 20 minutes. Thanks for visiting my space and that dish looks flavorful and awesome! Those look so fancy!! I need to try salmon asap - I've never had it before. Thank you for sharing these on Tasty Thursday! I know, right? No need to tell anyone how simple they actually are! We love salmon - it's so easy to work with and versatile too. :) Hope you enjoy!